Summary of Assignments: Following OCS, went to Ranger School and then stayed at Eglin Air Force Base for 11 months. He then went to 173rd Infantry Brigade in Vietnam. He received a head wound during an operation in the Iron Triangle. He also served as a Company Commander in the 5th Mech and as a Battalion Advisor to the 1st ARVN Division. He later attended the Infantry Advanced Course at Fort Benning. He returned to Vietnam for another tour in 1972 and got out of the Army in 1973. He spent the next couple of years traveling around the United States. The President of the United States of America, authorized by Act of Congress, July 9, 1918 (amended by act of July 25, 1963), takes pleasure in presenting the Distinguished Service Cross to Captain (Infantry) Stanley A. Blunt, United States Army, for extraordinary heroism in connection with military operations involving conflict with an armed hostile force in the Republic of Vietnam, while serving with Company D, 1st Battalion, 11th Infantry, 1st Infantry Brigade, 5th Infantry Division (Mechanized). Captain Blunt distinguished himself while leading his company during a search and clear operation through enemy controlled territory several kilometers south of the Demilitarized Zone in the northern area of I Corps Tactical Zone. On 11 November, his company was participating in a coordinated battalion attack on elements of the 27th North Vietnamese Army Regiment defending heavily fortified bunker positions. When his company’s advance was halted by intense’ Suppressive fire, Captain Blunt single handedly charged a heavily fortified machine gun emplacement and completely destroyed the position. In this same assault, he killed four other enemy soldiers at close range by hurling hand grenades into their positions. In the early morning hours of 13 November, in a continuation of the same operation, Captain Blunt infiltrated a seven-man patrol through some twelve hundred meters of closely defended enemy terrain under cover of darkness in order to reinforce and extract besieged friendly elements. He conducted this perilous mission without incident and undoubtedly saved the lives of the twenty-two trapped American soldiers. 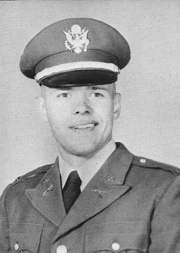 Captain Blunt’s extraordinary heroism and devotion to duty were in keeping with the highest traditions of the military service and reflect great credit upon himself, his unit, and the United States Army.